For years, the Park View Inn was one of the most visible abandoned and problematic sites in the city. Soon it could become the city's latest infill development site. 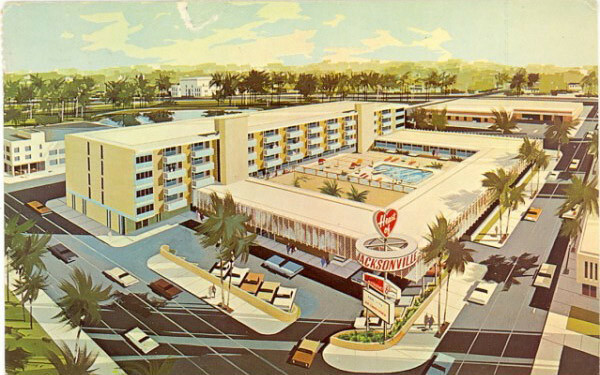 The Park View opened as a luxury hotel called the Heart of Jacksonville Motor Hotel in 1965. At the time, the mid century modern building boasted one of the best skyline views of the city. However, the hotel struggled with downtown’s decline as Jacksonville’s commercial epicenter. During the 1980s and 1990s, the property briefly operated as the Hacienda Motor Hotel and as the Hospitality Inn. In 1998, plans were made to redevelop the 236-room property into a Days Inn franchise. These plans failed to materialize and the hotel was forced to shut down in 2000 for multiple code violations. A rendering of the 2011 Park View Pavilion redevelopment project that failed to materialize. After accumulating more than $100,000 in Code-related fines, the structure was condemned in 1999. In 2010 a plan surfaced to redevelop the vacant site into a retail development called the Park View Pavilion. 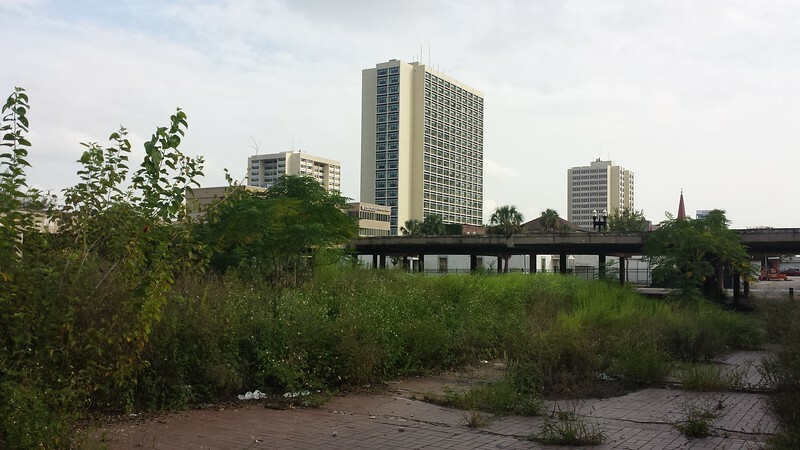 The City of Jacksonville through an agreement with the building owners Robert Van Winkel and David Muyres, razed the hotel portion in 2011 while retaining the parking garage structure. That demolition was paid for by using $300,000 in Community Development Block Grant (CDBG) money. The CDBG program is a program of the U.S. Department of Housing and Urban Development designed to ensure decent affordable housing, to provide services to the most vulnerable in our communities, and to create jobs through the expansion and retention of businesses. Phase one of the Park View Pavilion redevelopment plan included demolition and clearance of all of the building elements with the exception of the existing parking garage and structural elements for the first two floors. Once complete, the remaining structure would be cleaned, painted and stuccoed. In addition, the remaining two-story parking garage would have then supported 16,000-square-feet of new retail space at the intersection of Main and State Streets. The owners of Park View Inn had also signed a joint venture agreement with the owners of the EHT building (former Claude Nolan Cadillac Building) to jointly market the properties, with the intent to redevelop the EHT Building into 45,000 square feet of potential retail, entertainment and residential space. At the time of the partial demolition in 2011, the building’s owners were required to complete a redevelopment of the parking structure to include 20,000 square feet of ground floor retail and a 400-car private parking facility on the 2nd level. It is not clear whether that grant has been repaid to date as promises to redevelop the parking structure have gone unfulfilled. 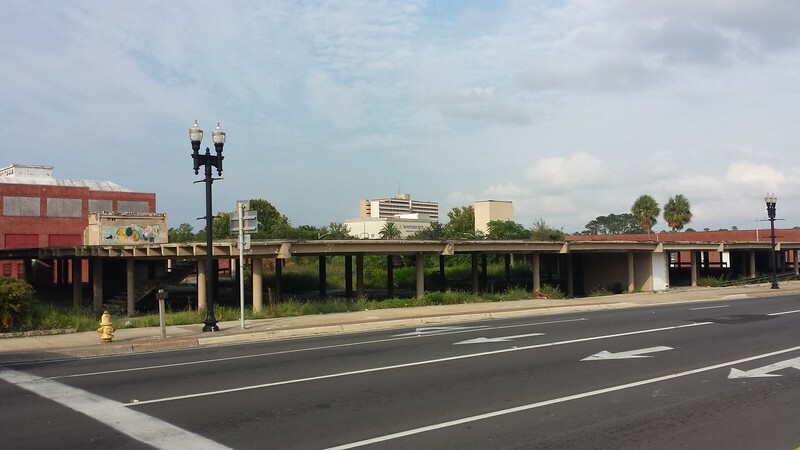 Prior to the parking structure redevelopment proposal, Van Winkel asked for public assistance to redevelop the former hotel into student housing for nearby Florida State College at Jacksonville in 2006. In true Jacksonville-style, demolition took place while the ultimate redevelopment plans fizzled. Today, all that remains is the ghostly shell of the hotel’s two level-parking garage. The skeletal remains of the Park View Inn in 2018. 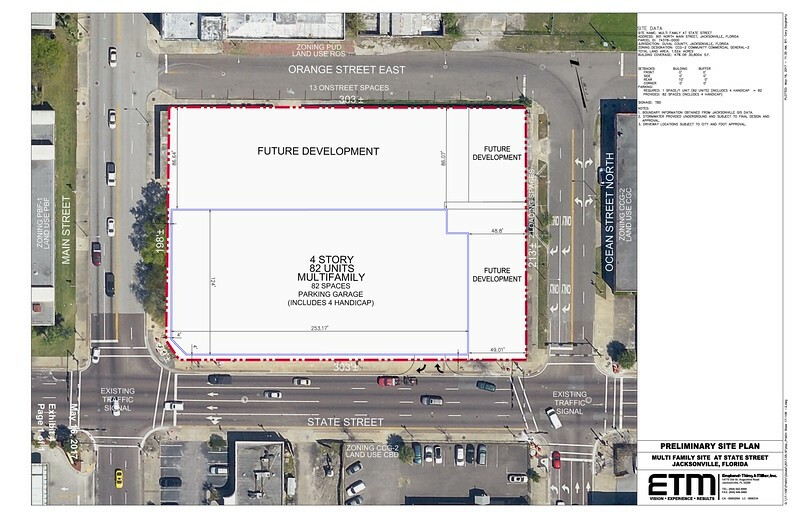 Looking ahead, the property owner Jacksonville Hospitality Holdings LP had rezoned the site in 2017 with Southport Development, a Tampa-based multi-family housing developer founded in 1995 that builds and acquires market rate rental properties. Southport’s market niche centers around developing and rehabilitating government subsidized housing through the Low Income Housing Tax Credit (LIHTC) program. The company has acquired and rehabbed over 1,200 multi-family units in Jacksonville. The 1.52-acre site has been rezoned (2017-483 and 2017-484) as High Density Residential (HDR) to allow for the development of a 4 story, multi family building with 82 residential units built above structured parking as well as off street parking. However, those plans won’t materialize until a federal environmental cleanup lawsuit filed in 2012 by the City of Jacksonville is resolved- stemming from a study by the Florida Department of Environmental Protection in 2000 that found tar residuals underneath the hotel. The property was formerly utilized as a manufactured gas plant from 1875 to 1913, known as Jacksonville Gas Works and Citizens Gas Company. In addition to the contamination issues associated with the former gasification plant, the site is registered as a leaking storage tank facility due to the presence of a former heating oil underground storage tank. Here’s a look at the Park View Inn during its last years as one of the urban core’s most problematic abandoned properties.